We finally managed to catch up with bassplayer ROB DE LUCA in a short break during his hectic summer touring schedule, which continues virtually non-stop through the Fall. No wonder he's smiling, with all those air-miles! Hi Rob! What's been happening in your world recently? A lot of UFO and Bach touring, which has been really great. 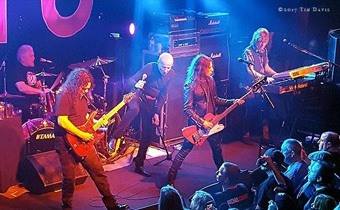 UFO has a new record coming out on Sept 29, then a fall US tour with Saxon to promote it. Bach has fall shows in USA, Singapore and Australia. Both are great live acts and give 110% every show. Definitely worth seeing! One of your original bands, Spread Eagle, is also due to be touring soon. When and where - and who? Yes, I'm very excited about Spread getting back out there! We have festival and club shows in UK and some shows in Germany (posted below). Spread Eagle will also be recording a new record in 2018, which is the first time I've mentioned that publicly. 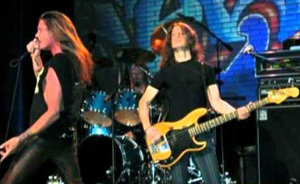 The band consists of Ray West on vocals, Ziv "Chevelle" Shalev on guitar, Rik De Luca on drums and me on bass. Here's a taste of what we do! How long have you been playing bass for UFO now, and how much involvement have you had in the writing of the studio albums since you came on board? 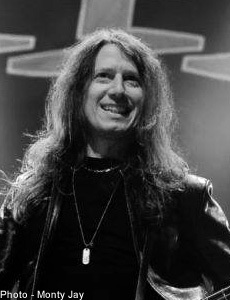 I started touring with UFO in April 2008, when Pete Way's visa problems prevented him from coming to America - so that's more than nine years already. How time flies! I played on the last two UFO albums and co-wrote three songs on A Conspiracy Of Stars. Check out King Of The Hill. 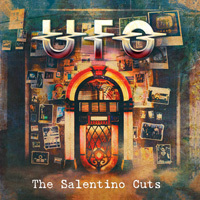 The Salentino Cuts is the long-awaited covers album from UFO, with re-workings of twelve songs including "Ain't No Sunshine" originally by Bill Withers, (I'm really looking forward to hearing UFO's take on that one!) and ZZ Top's "Just Got Paid", along with lesser-known songs such as "River Of Deceit" by Mad Season. How was the selection of tracks decided upon? As with most bands, we try different things and ultimately see what works best for the lead vocalist. In the end, Phil has to be comfortable "delivering" the song. If he's happy, we're happy - because we know he'll nail it! Where was it recorded and mixed? 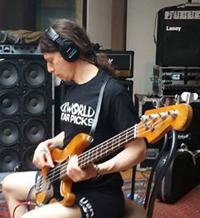 It was recorded in Hannover, Germany at Big House Studios in the summer of 2016 and mixed by Chris Tsangarides at The Ecology Rooms, Chris's studio in Kent, England. I just heard the full album in UK and I think the overall vibe is aggressive and menacing, which suits us very well! What's your favourite track on it, and what does the title mean? I like all of the songs, but some standouts for me are: Heartful Of Soul, The Pusher, Paper In Fire, and Too Rolling Stoned… The title comes from a restaurant in Germany that seems to have become our "clubhouse". I hear that you have a passion for vintage basses... tell us about your new website! About a decade ago I noticed that the vintage instrument market was getting very expensive. I also noticed there were many forgeries. Companies started offering replacement parts, "antiqued" parts and "retro" finish painting. I had bought and sold vintage instruments for years and had compiled a picture catalogue of original instruments and their components. So I worked with a German computer programmer named Martina Schiele to make all that knowledge available on one website called VintageBassWorld.com. 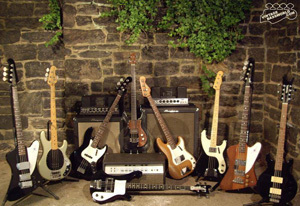 The site has hundreds of web pages of detailed text and thousands of pictures of Fender, Rickenbacker, Gibson, Musicman and Ampeg basses and amplifiers. It has basic information for the hobby musician and also has the most detailed info for the professional collector. It's the largest, most detailed vintage instrument website in existence. Yeah, there's obviously a LOT of down time on the tour bus…. If budget was unlimited what bass (vintage or modern) would you buy for yourself? 1963 Gibson Thunderbird IV, 1960 Fender Jazz Bass, Early 60's Jazz Bass in Burgundy Mist custom color finish. Should I keep going? Now you see my problem, it's too hard to pick just one! Remind us of those upcoming tourdates. Here's a list of the live shows, and as always, thanks to all the fans for your love and support.